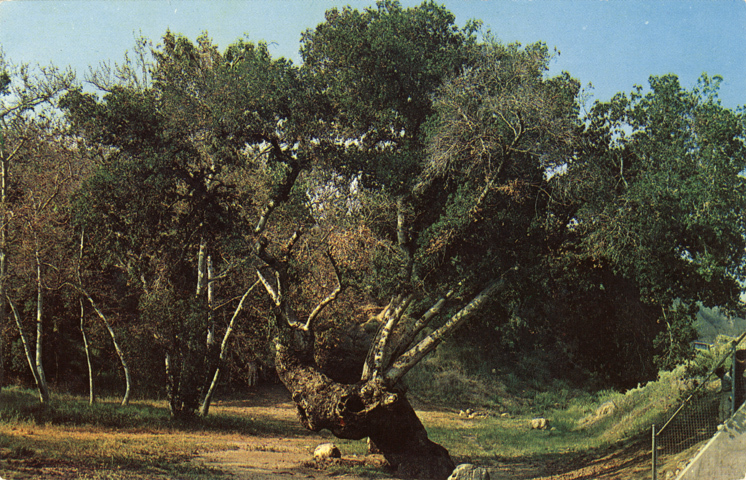 Oak of the Golden Dream as it appeared circa 1963. [Supervisor Mike Antonovich] – Supervisor Michael D. Antonovich announced that the Board of Supervisors unanimously approved a 50-year agreement for the operation, maintenance, development and control of the Placerita Canyon Natural Area in the Santa Clarita Valley. Home of the famous “Oak of the Golden Dream” where gold was first discovered in California in 1842, Placerita Canyon is a designated state historic landmark with an educational nature center offering nature walks, school programs and live animal presentations Tuesday through Sunday. Also located at the park is the historic Walker Cabin, built by Frank Walker in 1920. Connecting the Angeles National Forest, the Santa Susana Mountains, the Simi Hills and the Santa Monica Mountains, Placerita Canyon has sandstone formations, seasonal streams and riparian oak woodlands as well as cottonwood and native sycamore groves. The park offers eight different trails that network over 12 miles for park visitors. Placerita Canyon was first transferred from the state on November 1, 1949. However, since June 30, 1986, the park has been operating on a month-to-month lease. Placerita Canyon Natural Area is located at 19152 Placerita Canyon Rd, Newhall, CA, 91321.